A comprehensive guide to the process of pregnancy, birth, and babyhood. 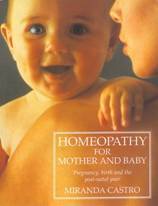 Encouraging and supportive to all parents, this book is well received by homeopaths, the caring professions and patients alike. Find out about the many safe, effective, inexpensive and non-medical remedies that homeopathy has to offer women in this important period of their lives. With reassuring, easy-to-read text, the reader will learn how to select remedies for hundreds of common physical and emotional symptoms. The book also offers a plethora of helpful and practical advice for making labour, birth and the post-natal period as relaxed and trouble-free as possible. This guidebook offers a wealth of natural-health information every expectant parent should have at hand. 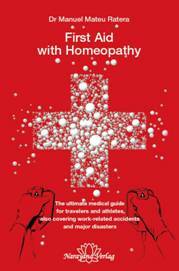 Written by one of this country’s most experienced and talented homeopaths, this is a beautifully presented book. More than a First Aid manual, it describes the process involved in arriving at the accurate prescription. 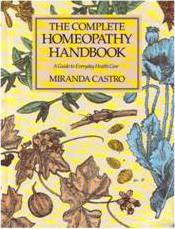 The Materia Medica contains 100 remedy pictures and is very easy to read. ‘The practice of homeopathy, whether in the consulting room or in the home, is highly effective in curing a wide range of illnesses from minor health problems to very serous conditions. This book focuses on everyday complaints that you can treat yourself. In this climate of greater life expectancy and yet increasing ill-health and disillusionment with modern wonder drugs, people are looking for safe and effective ways to treat illness as well as to improve their health. Homeopathy offers a safe alternative as it treats the whole person – the physical as well as the emotional – and therefore plays an important role in the movement back to a more holistic approach to health’.